Along with drawn-out meals, coveted tables at cafe terraces in the sun, and freshly baked, still-warm bread straight from the local boulangerie, Sundays are essentially sacred among Parisians. This is not necessarily in a religious sense, although some people do observe it that way. 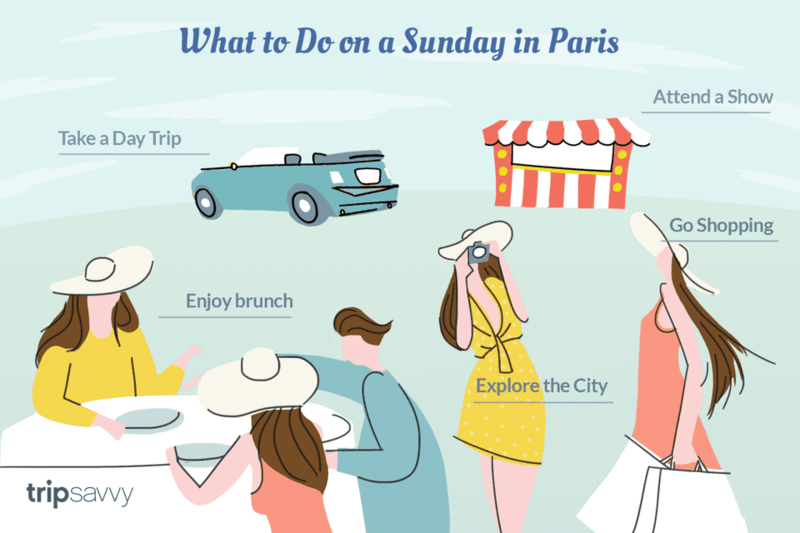 For most locals, Sunday is the day set aside to amble the streets freely, share a lazy brunch with friends, hit one of Paris' many charming cinemas, or spend an afternoon at the Centre Pompidou enjoying the latest exhibit there. What's Open on Sundays, Anyway? Contrary to popular belief, most of the city stays open on Sunday, including restaurants and cafes, museums, monuments, bakeries, etc. Most shops and some supermarkets are a noteworthy exception, as explained further down. In less tourist-heavy areas, too, you'll be more likely to see things closed on Sunday. You shouldn't have any trouble finding something to do, whether you're angling to hit tons of sights, shop, have an impromptu gourmet picnic, Parisian-style, or just roam aimlessly around the capital's endlessly fascinating neighborhoods. If you want to visit a museum, monument or other major attraction, we highly recommend visiting the appropriate official website to confirm whether they're indeed open. While most shops specialized in clothing, home items, accessories and other items do close, there are several areas and shopping centers that stay open. The Marais district is one such area that's a favorite for Sunday window shopping, followed of course by lazing and people watching at a cafe, and perhaps some incredible gelato at Pozzetto, one of the city's best gelaterias. The beloved Mariage Freres teahouse (pictured above) is also open. Browse our guide to Sunday shopping in Paris to find out what shops and shopping centers are open. You might also consider spending a morning or afternoon at one of Paris' many puces (flea markets), admiring antiques, sifting through cartons filled with dusty old records, or just enjoying the bustling, cheerful ambiance of sellers calling out deals and displaying their often-curious wares. Want to stock up on picnic goodies or find a unique gift? Take a whirl at an open-air Paris food market, including the colorful and coveted Marché Aligre (tons of pictures here). It's full of some of the best fruit and vegetable stands and lined with traditional shops, all open on Sunday morning to early afternoon. Love books? 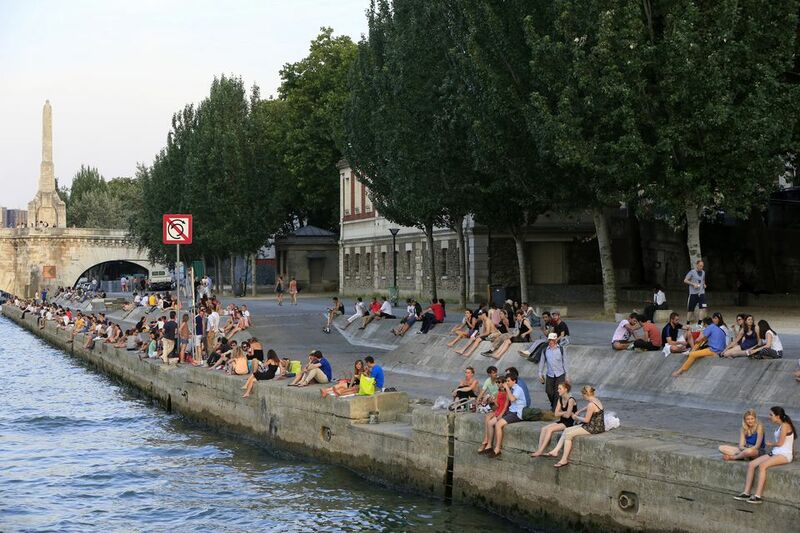 Check out the traditional Seine Riverside booksellers, instantly recognizable by their famous green metal boxes. If you're into the weird and the unusual, browse our guide to the city's strangest and quirkiest shops for suggestions on where to head. Top Traditional Parisian Sidewalk Cafes: What could be more truly Parisian than stealing one of the best tables for people-watching in the city? In particular, you can aim to dominate at these 5+ fantastic cafe terraces. ​Wine bars are frequently open on Sundays, and offer an excellent way to wind down the week with a delicious glass or two, accompanied by local cheeses and charcuterie. The ambience is friendly and convivial, and it's certainly a cultural experience worth having. Iinterested in literary or cultural history? Check out this self guided tour to the 10 Best Writers' Haunts in Paris, and have a drink or coffee in the legendary places where the likes of Voltaire, Simone de Beauvoir and James Baldwin met and wrote. Since the city runs at a slower pace on Sundays, getting out and into the environs for a day trip from Paris can be a great idea. Explore Claude Monet's gorgeous gardens at Giverny, or pop over to Versailles to see how French royals once lived. Also consider a trip to the Basilique Saint-Denis, featuring an amazing royal necropolis (burial site of kings and queens). Especially if and when it's rainy or cold, this makes for a wise Sunday plan. A true cinephile's paradise, Paris boasts more cinemas per capita than perhaps any other major city, and Sunday is a perfect time to enjoy a good film or two. Hit the Cinématheque Française (French Film Center) for a double treat of movies and a fascinating film museum exploring the history of celluloid, or check out our complete guide to the best cinemas in Paris, from multiplexes to old arthouse venues. Alternatively, you might book a show (and perhaps dinner) at one of Paris' best traditional cabarets, including the Moulin Rouge or Lido. This can be an entertaining and relaxing way to spend a Sunday evening.